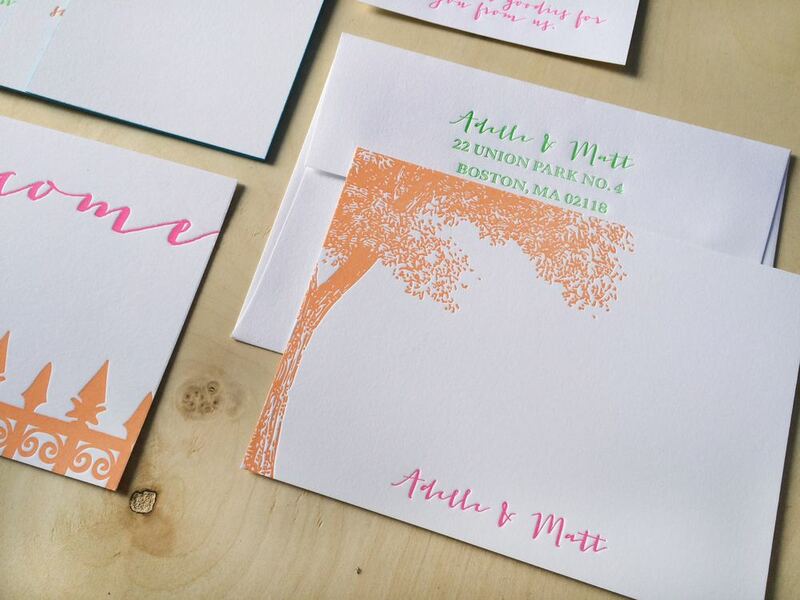 Adelle and Matt were married in Union Park, in Boston's South End, They wanted their invitation to be about the neighborhood, and to be lively. We decided to create a gate-fold enclosure to house the invitation suite, the fence detail is drawn from the fence surrounding Union Park. 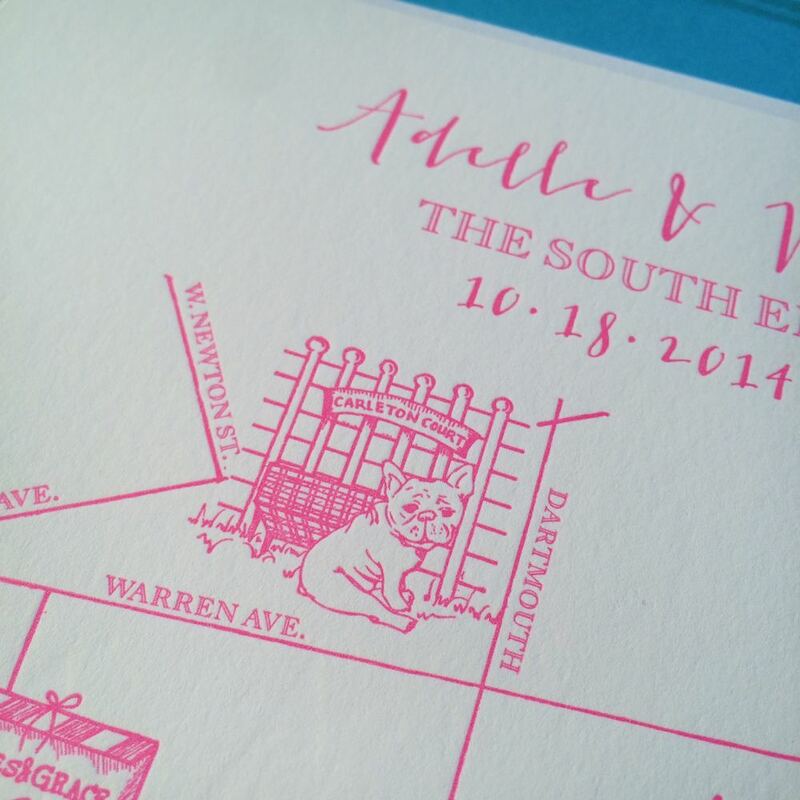 We created a custom map of their favorite neighborhood spots, and then created a suite of paper to present the locally procured welcome treats as well. 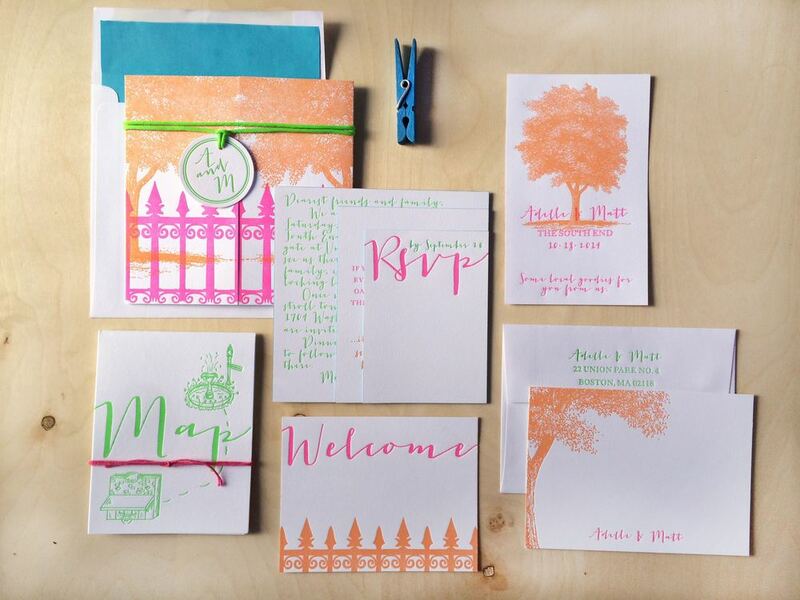 This is a four piece invitation suite, plus informal notecards. 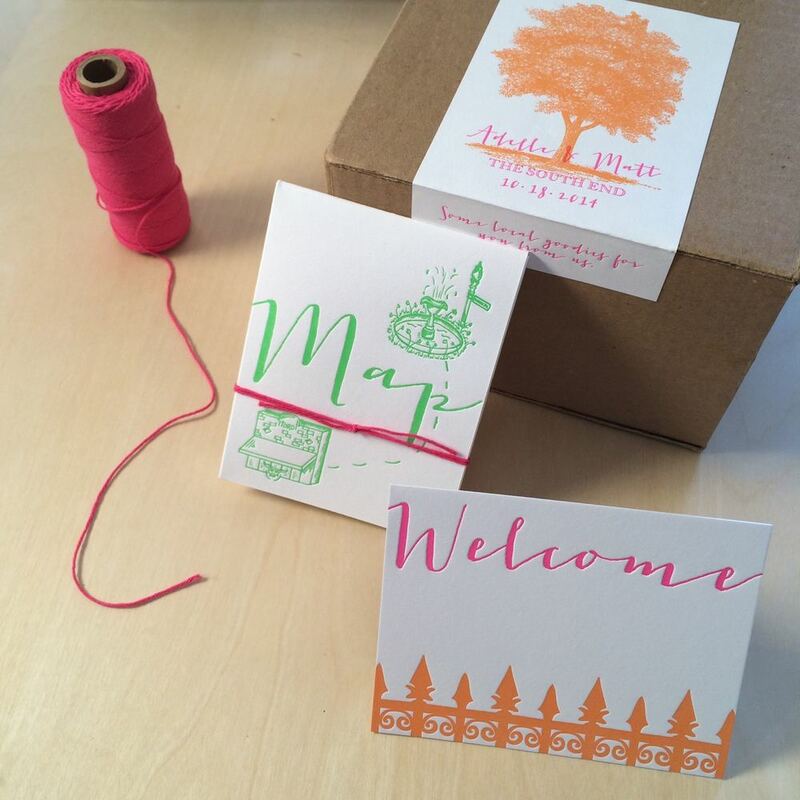 Welcome box package includes notecards, folded map, and adhesive box labels. Neon pink, neon green, and orange are used across the various pieces, edges are painted in bright blue. Custom map commissioned from Dena Leone. 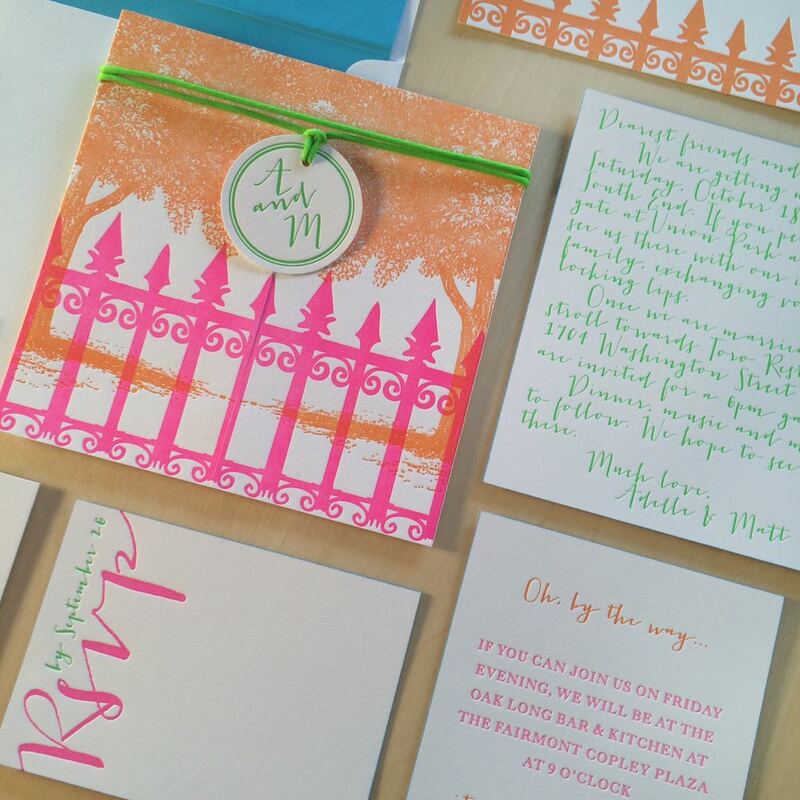 All pieces letterpress printed on 100% cotton paper in a bright white, heavyweight stock, and tied with neon green cord and a custom monogram tag.
" Rachel was amazing to work with- she made our invitations, rehearsal dinner invites, thank you cards, and all sorts of goodies for our "welcome" boxes. Rachel is incredibly creative and really helped to make our vision for our wedding come to life! Just about everyone commented on our invitations.- "unique," "whimsical," "thoughtful"...people thought they were just spectacular. She captured the whole vibe of our event and really set the tone for our big day. Rachel is so easy and fun to work with and she was definitely one of the highlights of our wedding planning!"